Maliha was one of the smartest students in our class. With her long black hair, small upturned nose, tall slim body and large eyes, she was beautiful. She was polite, but so remote. Despite the fact that everyone wanted to befriend her, she preferred to be alone. I was her only best friend. We had been classmates for three years, since 7th grade. From the beginning I knew there was a world hidden behind those gorgeous eyes, a world she didn’t want to share with others. I never asked her about her past life because she was my best friend and I didn’t want her to feel sad and those lovely eyes become full of tears. One day in the fall of 2005 on the way to school, I saw that she looked extremely tired. One could see redness in the white of her eyes, as if she’d spent the entire night crying. This time I couldn’t help it. My friend needed sympathy and I had to be of help at least by listening to the pain she suffered, giving her hope so she could see a future for herself. But I had no idea what was she suffering from. “Emaan, you are the greatest person I have in my life. Wait until we reach the school. I will tell you everything,” she said, and we continued walking toward the gate of the school. We arrived half an hour before the first class. She asked me to go sit on the porch behind the administrative building, where there was no one except the old white-bearded farmer of our school watering the flowers and grasses. She cleared her throat and took a deep breath while staring at her toes. “My dream to become educated has not been easy,” she said. “Today I can read letters. I can write poems. I know some English. I have the ability to read the names of my mom’s medications and when and how she should take them. I have gained the power to cope with stress no matter how extreme and hard it is. Above all, I am still going to school, which is the goal of my being alive. “I have been in Kabul since 2002. Before, I lived in Farah Province with my uncle. I used to go to school there and our family was supported financially by our uncle. We inherited some properties from our father, but after his death, my uncle became the owner while we received only a stipend from him. From the beginning, my uncle was against my education since he was a quite famous elder of our village and didn’t want to be called coward or “American” just because I went to school. But my mother didn’t give up and continued to support my education. As a result, my uncle made a fake document and legally owned our property and kicked us out of his house. My mother decided to sell her gold stuff, and desperately took me and my small sister to Kabul. For some time, we lived with our aunt. Then my aunt was fed up and asked us to leave. To rent a house and earn the money for living and my education, my mom decided to sew handcrafts and do cleaning and cooking for the family who gave us a room in their house. I also used to help mom, but she wanted me to focus more on my studies. She told me I was her hope window through which she could see a future for our family so I had to study hard rather than do chores. I thought, then, of destiny as the cruelest thing in our lives. I thought of dreams, hope, ambitions, and time. I realized one thing in that moment: Despite our extreme struggle, time has the power to take anything it wants from us, be it our beloved grandmother, our love, or our desire of education, which meant everything to my friend Maliha. “Who is the guy you think will support you and your family?” I asked. At that moment, I wished I were a man so that I could work as hard as I could to help my friend reach her dream. 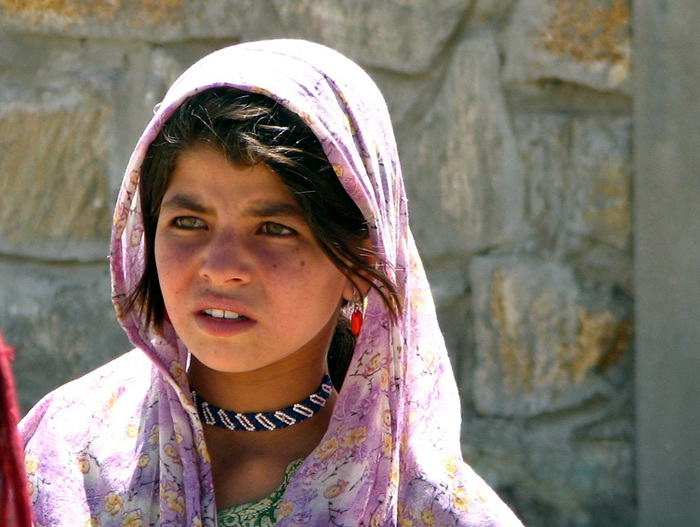 I hated being a girl, at least in Afghanistan. I felt so helpless. I was deeply involved in these thoughts when suddenly the bell rang and we had to go to class. The day after that, I had to come alone to school. Maliha got engaged to Hamed, and after one week, they got married. Always when I passed through the door of our school, I wanted to kiss and hug my sweet friend and see her looking like an angel in her black-and-white school uniform. But I couldn’t see her anymore. Hamed didn’t allow her to see her friends. She is a housewife now. I don’t know whether or not she writes, or whether he beats her. But I saw deep in Maliha’s eyes the light which will take her to her destiny through all this darkness. She will become a writer and her poems will touch our veins and arteries one day. Maliha, best friend, you will make it! It is difficult to not have tears in my eyes after reading this story. You have to be strong for your friend Maliha! Loved the last few lines: “But I saw deep in Maliha’s eyes the light which will take her to her destiny through all this darkness. She will become a writer and her poems will touch our veins and arteries one day.” Amen to that. Do you have any poems by Maliha and would you put them up here on AWWP? Would love to read them. Emaan, I read your words and it was impossible not to feel sad for your best friend. It is very hard for a person to give up her/his dreams, it is like a part of us going away. As you, I hope Maliha can find her happiness one day. her dream, but i am afraid that she will not manage all alone. How could one help her? Remember you are always a part of her, Emaan. Imagine for Maliha. Somewhere, out there your imaginings will reach her. Imagine her to be happy; imagine her writings; imagine her smile at her perceiving your imaginings. Such will be her thoughts oftentimes. Thankyou. Thank you for sharing your friends story with us. We don’t always know it, but we are placed in situations where perhaps we become the conduit through which someone else’s story gets told because it has to see the light. Its meaning will burn brightest for those of us who empathize with Maliha and every young woman like her. As another poster suggested, please share some of your friends’ poems with us. Emaan, Thank you for sharing Maliha’s story. She will make it someday, and you too! You have a gift for writing. This is a heartbreaking story, beautifully and simply written. I admire the hope at the end, especially. Well done! Such a small world and so big the contrast! Dear Emaan, please make your voice and Maliha’s poems heard even more. They are good voices, full of love and hope! Who knows maybe some day these voices will be so powerful as to make a real difference in Afghanistan’s reality! My best wishes to both! Emaan, thank you for sharing Maliha’s story with us. I wish for her voice and yours to be heard. What you share with us is so important. If you continue to tell your stories and write your truth, I believe you will help all women who are without choices to “make it.” Thank you. It is wonderful that you can write because you have such important stories to tell. Your story about Maliha is so very sad and I feel so grateful to know about you and your friendship. You were right to encourage her to talk; you are a good friend. it’s so touching story, remind me to my childhood. i had a hard of life too when i was a child. but it though me to be strong woman now.